Denise McGaha delivers fashionable, diverse, and adventurous designs for clients who live on the fast track; specializing in turn-key, concierge-level service delivered in 90 days or less. When experiencing a Denise McGaha interior you may never know how exciting the ride was that brought about that room. With a roster of clients from professional sports figures to busy executives, Denise offers her discriminating clientele a true luxury experience with a timeline. By offering Deadline Driven Design solutions, her clients receive exhilarating interior design coupled with prompt and nimble completion of their project. It has been said that Denise McGaha Interiors, is consistently ahead of the curve not just influencing interior fashion, but often dictating it. With a seamless blending of multiple interests Denise is able to offer her affluent clients access to Dallas’ best-kept secret: her black book of high-end concierge services. Denise’s sophisticated methodology and solid business acumen evolved through her decade in the corporate landscape of luxury retailer, Neiman Marcus, where she honed her well-trained eye, and was an integral part of the team that launched NeimanMarcus.com. Typical Job Costs:Denise McGaha offers Designed in a Day for a design fee of $2000.00 for two rooms. We also offer full-service design based upon the size and scope of the project. 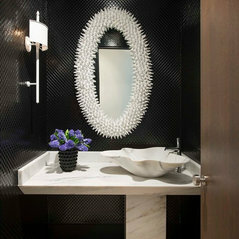 For more information on our design services please visit our website (www.denisemcgaha.com). 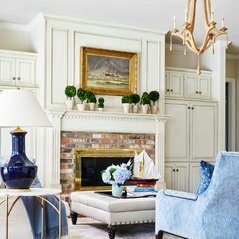 Pleasure working with Denise McGaha Interiors. We have used them for our business and home projects. We constantly receive compliments on the work they have done. Commented: CountertopsThank you so much for your interest! Unfortunately, we do not have the exact details on this particular stone. Commented: Love the backsplashHello! Thank you for reaching out! The countertop slab and backsplash are Eurika Granite sourced through Allied Stone. Let us know if we can be of further assistance!